Naomi Press, a sculptor of international stature, will be exhibiting in London this October. On show will be her stainless steel, brick and silver work. Press’ sculpture, critically acclaimed by Clement Greenberg, has been exhibited in some of New York, Cape Town and Johannesburg’s most prestigious galleries. Her artwork has been placed in a number of public and private collections in the United States, Canada, Great Britain and South Africa. The exhibition, curated by internationally acclaimed art historian and critic Edward Lucie-Smith, is a retrospective of Press’ work spanning forty years. Press began her career in the arts as a disciplined and skilful ballet dancer and it was her understanding and training in this artistic field that had a profound and compelling impact on her sculpture. The refined texture and sensitive lines of her work are indicative of the corporeality that inspires her. In the early 1980’s, the artist met Clement Greenberg. For Press, this was a pivotal moment in her artistic practice; with Greenberg, she visited the studios of Kenneth Noland, Anthony Caro and Helen Frankenthaler. 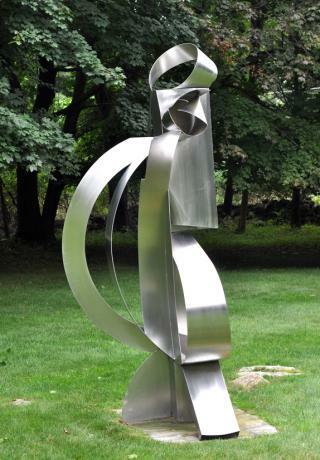 The artistic freedom of these artists led Press to her first forays into abstract sculpture. These pieces, made in steel- a material that we associate with rigidity and strength- convey a lightness and movement synonymous with ballet. Paraphrasing Virginia Woolf, Press speaks of “the touch of a butterfly’s wing on a framework of steel”. Each phase of Press’ artistic career is a direct reflection on her geographical and personal situation. Exemplary to this is her move from steel to brick in 2001. Press divided her time between London, New York and Cape Town, and it was the red brick buildings of London, decorated with elaborate gables, cornices and cameo busts that was her next focus. After extensive research, she visited a foundry in the hills of West Sussex which had been the source of red terracotta bricks for hundreds of years. From the architectural fragments and shaped bricks which she collected there, she began her “Citadel” series, each a fully resolved work, which will be shown together for the first time in Bermondsey in a full- scale installation. Also in London, and ever alert to the contemporary trends around her, Press turned her eye to the world of beauty and fashion. In her newest “liquid silver” sculptures, she explores the extremes of beauty and fashion, the obsession with glamour, shoes, the runway and the youth culture of today. One of her newest sculptures evokes Will and Kate on a bed of roses.